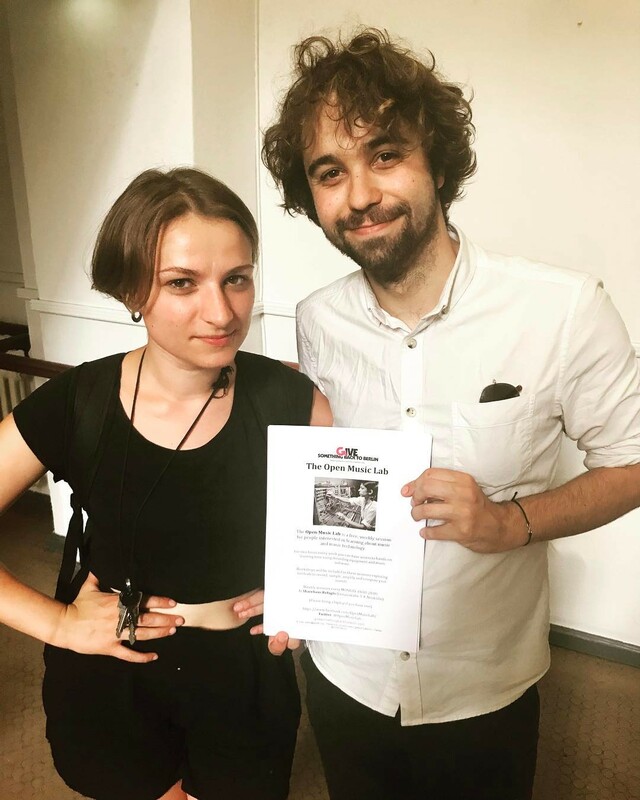 Ben R. Osborn and Rachel Margetts are the pioneers of one of the Open Music School’s projects – the weekly Open Music Lab – which takes place every Monday at Refugio Café. United by a passion for music, their goal is to share their musical knowledge with different communities. 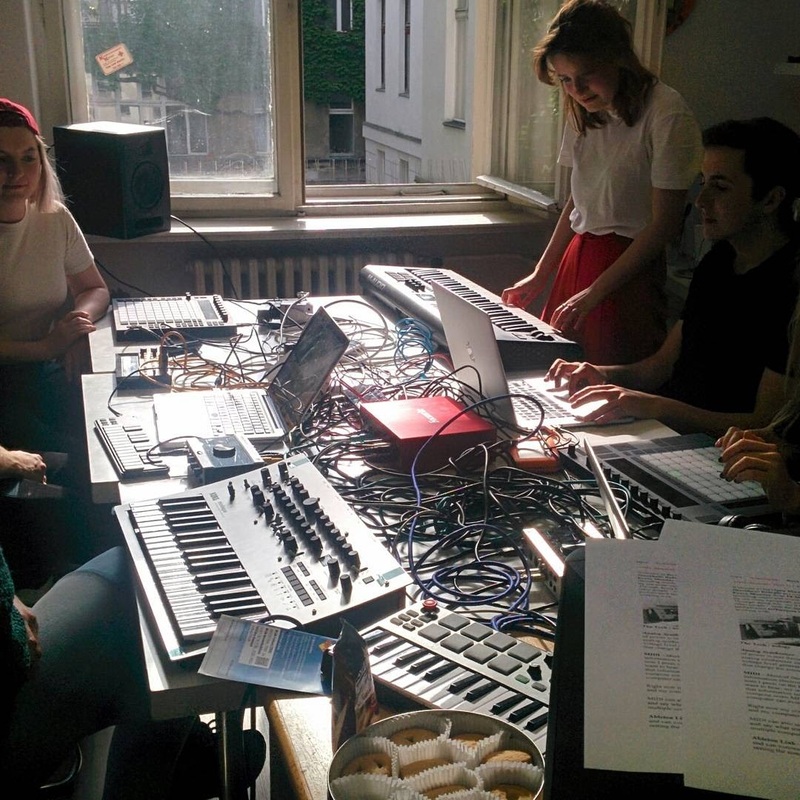 Abeera Atif met up with them to talk about what attracted them to Berlin, why they started the Open Music Lab, what they feel it represents and their vision for its future. Ben R. Osborn and Rachel Margetts. Source: Annamaria Olsson. Ben: I first came to Berlin in 2016 with Rachel. We wanted to live together, and found a friend of a friend who was renting out his room, which was in the heart of Neukölln and super cheap. Coincidentally, the “friend of a friend” was Chad R. Matheny (aka. Emperor X), who also started the Open Music Lab with us. I moved back to the UK for a while to work, and came back to Berlin at the end of the year. 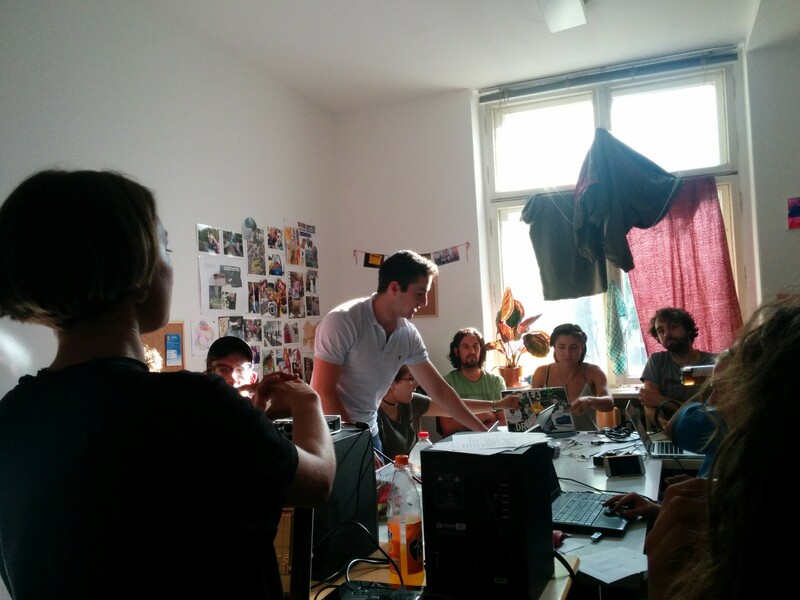 A big reason for me coming back was that we had started the Open Music Lab, and I really wanted to come back and carry on doing it – so in a way, I came to Berlin to do this. Rachel: I think it was a fascination with the history – this sort of “living history” that Berlin is famous for. The political system is also so different to the one in the UK. A lot of it had to do with the vivid music and art culture that Berlin has – these two things combined really made me want to live here. How are you involved with GSBTB? Ben: I had volunteered at a few different things, like guitar lessons with the GSBTB Open Music School, the Open Art Shelter and Open Kitchen. But our main role at GSBTB is that every Monday we host the Open Music Lab, which is basically a music skills workshop revolving around teaching musical composition and production. Rachel: I first heard about GSBTB when I was looking to do volunteer work with refugees. I wrote to Hania Hakiel, who was running the Open Art Shelter. I went along with her to one of their Friday outings and there was a little jam session, so I brought along some instruments and made noises for some kids. It was lovely, because there was already a very nice community in place. Open Music Lab students working together to create a beat. Source: Abeera Atif. Where did the idea for The Open Music Lab stem from? So I searched online again and found GSBTB – I wrote them a message telling them that I was a musician and I wanted to volunteer as a teacher. Tom Young from the GSBTB Open Music School got back to me asking me to get together with some other musicians. During our brainstorming session, we were asked what we could teach – and since everyone was writing down guitar and piano (the two things I could teach as well) I wrote down “production and composition”. I told Rachel about it, and we decided that we were going to start running these lessons that would provide an opportunity for people to learn more non-traditional ways of producing music. Berlin is a very musical city, but it’s not necessarily a city that’s all about traditional instruments. When people think of Berlin, they think of electronic music, because it’s everywhere. Often when people think about music, they want to make a beat for their lyrics or learn to record sounds – so we thought we would give them the opportunity to learn the technical side of things as well. 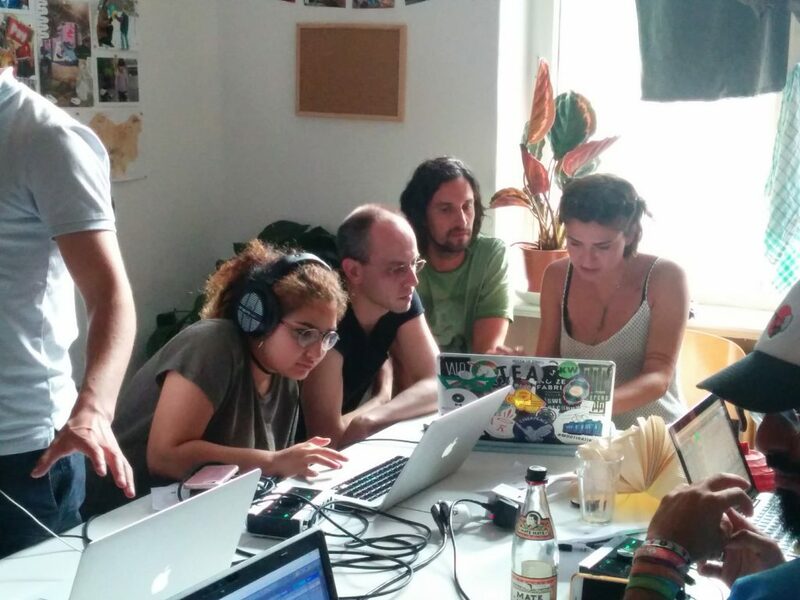 A jam session with the Open Music Lab. Source: Abeera Atif. Rachel: I heard about the Open Music School from Ben, who had gotten in touch with Tom about the Open Music Lab. I felt I was better equipped to enter the music side of GSBTB – Ben, Chad and I realized we could work with music technology and work towards accessible ways of using music and sharing musical experiences. I think it stemmed from my wanting to be involved in a new form of creativity – that’s how I got involved in electronic music in the first place. I realised that it’s something a lot of people are interested in, but most of them don’t have a direct, easy or free way of getting into it. We also thought about how we could bring people together in this shared pursuit. There’s a lot of YouTube tutorials and information available online, so there’s a big culture of people making music in their bedrooms. That’s great, but I wanted to see whether there’s a communal way of doing the same thing in the particular context of creating an environment that is open to everyone and bringing different communities together. 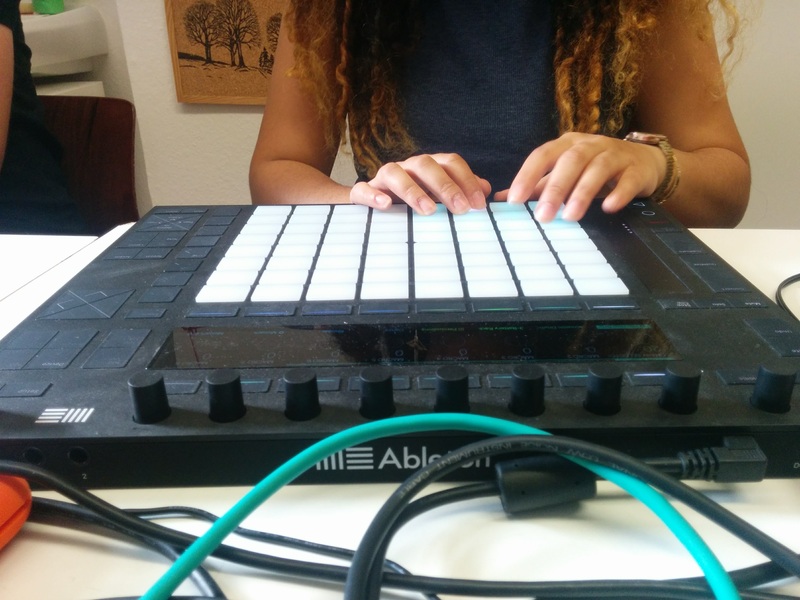 Open Music Lab student jamming on an Ableton Push. Source: Abeera Atif. What are your long-term goals for the Open Music Lab? Ben: I would like it to keep going, obviously. I think the best thing would be if we got to everyone who needed it. It can be really intimidating learning these things – you can feel like the software and machines are difficult to get started with, and they can also be very expensive to get your hands on if you’re not making a lot of money. So I’d really love for it to grow and reach more people. What’s really amazing is seeing people in the group start to work together, and I would love to see them carry on doing their own projects and collaborating with each other. The nature of our work is very collaborative; everyone is sharing the equipment or their computers and teaching each other all the time. There are people in the group who are already very accomplished, and then there are those who have learned a lot since they’ve joined us – it’s amazing seeing people come from such different backgrounds and get together to make weird pieces of music. I just want them to keep making amazing music all the time. Rachel: A long-term goal would be to have a permanent space, set up with some computers so that people who didn’t have access to computers at home could come and use that space in their own time. Also, organizing collective performances or bigger projects that connect over a period of time instead of just individual workshops. I would also really like to create an on-going group piece, that would be really great. Rachel leading an Open Music Lab session. Source: Abeera Atif. Ben teaching the Lab about sound waves. Source: Abeera Atif. What’s your advice for people who want to get started in music production or composition? Ben: If you want to do it, then you can do it. I am someone who didn’t really learn music as a kid. I was actually told by music teachers in school that I was very “un-musical” and I wouldn’t be able to do anything with it, but it totally became my life as I grew older. I did it all by teaching myself and asking my friends to teach me. I think you can definitely do it if you want to and there are always people around who can help you. You should just come to one of our classes and meet us and the people there. We can help you – but in the end, we’re also all just learning! Rachel: There are absolutely no rules, so don’t listen to anyone who tells you that there are. With everything, the more you know, the more freedom you have. You’ll obviously get a lot of information from a lot of different sources, but there isn’t one route to making music; at the end of the day, your own way – whether it’s considered to be objectively “good” or “bad” – is more interesting and therapeutic than being told by people that you should do things the same way everyone is doing them. Also, just use whatever you can to make whatever you can – but remember to have fun doing it and don’t push yourself to ridiculous extents. You can find Ben and Rachel‘s music on SoundCloud. 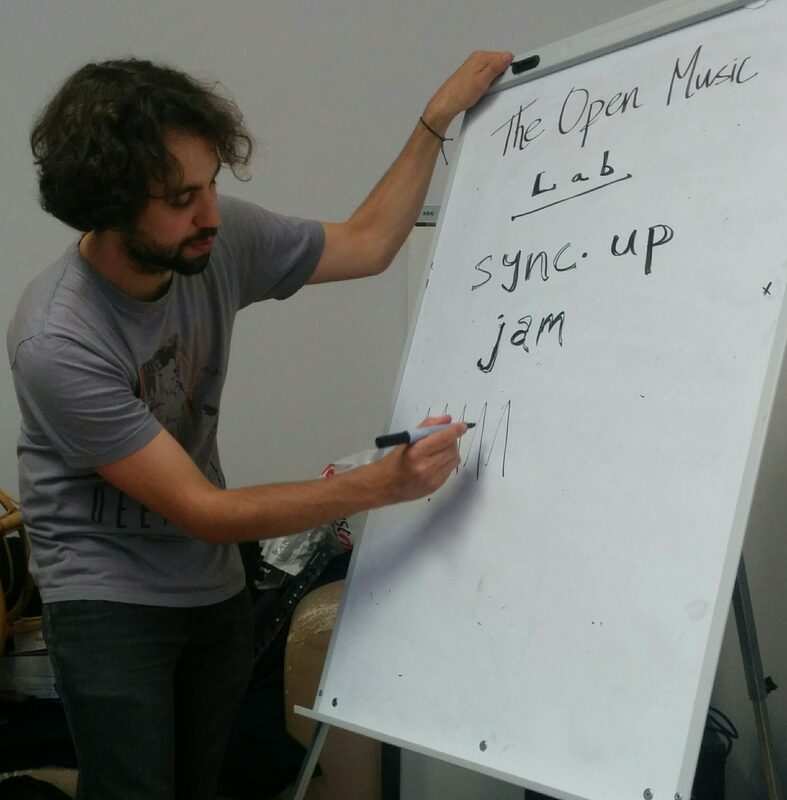 Find the Open Music Lab on Facebook to keep updated with the weekly Monday sessions! Abeera Atif is the communications intern at GSBTB. Musician and GSBTB team member Sami talks about playing music in Syria, his band and the Arabic cultural scene in Berlin.